Consider reading all of the sections to get a good understanding. If you're able to do that, any game that is known to run okay should be of little difficulty to run, as long as you have the hardware. A large chunk of games will not behave correctly and will be covered by each game's page on the Compatibility List which is linked below. Breath of the Wild - Game Update v1.5.0 is recommended for full compatibility. When opening Cemu, make sure to download your Shared Fonts. Open Cemu > Download the Shared Fonts with the link that appears in the main window. These are REQUIRED for various titles to function correctly, such as Mario Kart 8, Super Smash Bros. Wii U, Mario Tennis: Ultra Smash, and Super Mario Maker; along with other titles! Allows you to set up a Gyro-enabled Device / Controller / Phone to use with Motion Control games. Allows in-game cutscenes to play on various titles instead of crashing or a glitchy green-screen. Lets you play games in fast-forward or slow-motion mode under Debug. Override high DPI scaling behavior. Integrated Graphics are highly advised against for emulation as they do not often meet MANY requirements. Make sure it's running on Maximum Performance Mode. 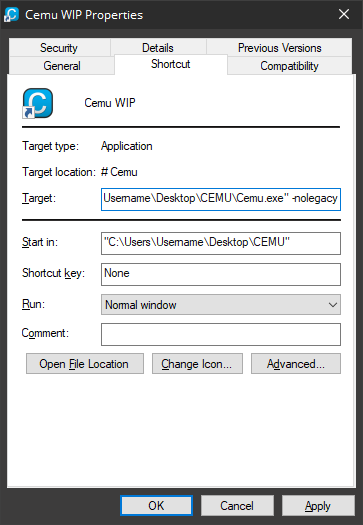 Note: As of CEMU 1.15.1, -nolegacy is default. You may try using -legacy instead. If the issue persists, it's one of the following: update your iGPU driver, the game will not work for that specific iGPU, or your iGPU is simply too old. Translates CEMU's UI to the users' preferred language. Enables Discord Rich Presence when users view your status; shows what Wii U game you're playing, etc. Enables the menu bar for options while in Fullscreen. Optionally change where installed Game Updates, DLC, Save Files, and other Wii U NAND information is stored. Where your games are stored. You can have multiple paths. Should only be turned off if you're using Gsync or Freesync. Syncs the CPU and GPU, much like the Wii U. Will help prevent games from breaking. Last I heard, this option will be removed soon. Mainly for testing purposes. Precompiled shaderCache does not work for Nvidia GPUs at this time; it does work for AMD GPUs. For pixel-art games, using Nearest Neighbor will keep the game sharp (play in fullscreen mode). Test to see which filter looks better for you though. "Stretch" may be good for uncommon display resolutions. You can test the alternative option if you desire. If you notice crackling audio in games, you should try increasing the latency until it stops. Select which audio device you wish to use for (Main) TV Output. Stereo is the only option available for now. Select which audio device you wish to use for Gamepad Audio. Meant only for BotW, additionally FPS++ and Static FPS++ will handle this without you touching it. Note: Will be greyed-out if a gameProfile has set this option automatically. Few games require High, change it on a per-game basis, always keep it Low otherwise. Enables Cemu's more accurate CPU & Audio timing mode. Note: This should be enabled even if you use another mode in Debug such as QPC. Not recommended except for debug and testing purposes. Slow. Recommended for most games, the other choices will likely fail to boot or freeze the game. Testing is welcome. Additionally, recommended for Dual Core CPU owners. On few supported games: 4-Core+ CPUs can see a performance gain. Breath of the Wild is supported. On few supported games: Some 4-Core and most 6-Core+ CPUs can see a performance gain. 4-Core CPUs can see better FPS Stability but lesser FPS, but some will obtain better FPS; possibly increased CPU temperatures. Cycle Based is for debugging games (and is slow,) mainly testing crashes and freezes. Try this if you freeze in a game, etc. Note: Affinity settings can only be changed if you have Cemuhook added to CEMU. Test each option in-game to see what benefits your performance the most, stick with it for all games. Dual-core CPU Owners should always use "All Logical Cores"
4-Core+ CPU Owners that use Dual-core Recompiler should try each option and see which gives them the best performance. 4-Core+ CPU Owners that use Triple-core Recompiler should likely use "All Logical Cores"
Any CPU will work, technically, but AMD CPUs typically lack Single-Thread processing power. Generally speaking (for Breath of the Wild and almost any CPU), you want to be over a 4.0GHz clock speed. Additionally, Dual-Core or Triple-Core Recompiler options should allow better performance in the few applicable games that support it, especially Breath of the Wild. Single Thread IPC and Overclocking are the most important factors for how well CEMU will perform on your PC! See the Recommended Settings section for what is recommended under CPU Options / Affinity. This experimental setting allows extra cores to be utilized for PPC CPU emulation instead of 1, however not many games actually utilize multiple PPC cores and currently causes stability issues/crashes or offers no benefit for most titles. Dual Core Recompiler [requires] a minimum of 4 Cores + Threads available. Not recommended for Dual Core (2 cores+threads) CPUs; system instability. Triple Core Recompiler [recommends] a minimum of 4 to 6 Cores + Threads available. Not practical to use on pre-8th generation i5 and pre-6th generation i7 Intel CPUs, and most 4-core CPUs. We recommend at least 8GB RAM for most games, but preferably 16GB+. If you run out of RAM and have a very slow SATA HDD, you are either likely to stutter relentlessly in-game or you may possibly have Crashes. Solid State Drives (SSD) are a boon to users with lesser amounts of RAM, as your PC will push data to the PageFile on your SSD if you set it to do so. They are much faster than SATA drives and therefore less likely to become unstable and crash with lesser amounts of RAM. PageFile: A pagefile (virtual memory) is essential to have in order to avoid crashing when running out of available RAM. Instead of crashing immediately when exceeding RAM limit, you may experience lower performance when a pagefile is used and may also experience additional in-game stutter when swapping. One way to see if one is using a pagefile while using Cemu is to see their "total commit size" in task manager and pay attention to if the number shown being used exceeds the amount of physical RAM installed within your PC, as pagefile usage is typically not shown under RAM usage statistics. Your GPU vendor can also play a role in what your RAM usage will be in Cemu and will determine how essential a pagefile is, or how often it will be used, if at all. It is recommended to have a pagefile on an SSD or the fastest drive available, and to leave pagefile size as System managed size. Altering your pagefile size may cause your PC to become unstable, resulting in crashes of your entire system. Alternatively, some users suggest to have a custom size of .5 times your physical RAM as Initial size(MB) and 1.5 times your physical RAM as Maximum size(MB). Research is highly recommended before changing your pagefile settings. NVIDIA GPUs are recommended; they can take some strain off of your CPU and have better performance through threaded optimization/OGL multi-threading when under heavy CPU workloads. AMD GPUs perform great for all but the heaviest of games, their performance is HIGHLY dependent on your CPU processing capabilities. This may all change with Vulkan implementation in the future. Intel Integrated Graphics (iGPUs) are not officially supported but have decent compatibility. GPU power and available VRAM is not very important unless you want to increase your game's internal resolution or reaching higher FPS limitiations. If you lose noticeable performance when playing at a higher resolution it means you are GPU/VRAM limited and your graphics card/VRAM amount is not sufficient to maintain said resolution without a performance loss. It is possible to be GPU/VRAM limited at native resolution with weaker/1GB-2GB GPUs and iGPUs, to determine if you are throttling when under these conditions, lower your game's resolution and see if performance improves. It is recommended to use a modern GPU with at minimum 4GB VRAM. Reaching 60FPS is almost entirely determined by your CPU. 95% of users will not obtain stable 60FPS even with optimal settings. A large majority of users will not obtain 60FPS no matter what. We recommend anything in range of a NVIDIA GTX 600 or AMD HD 7000 series or above. c. ) An alternative internal storage drive. d. ) An external storage device. Note: Not recommended unless USB 3.0 or 3.1; depending on the device, it may have slow data read/write speeds. However, even with slower read/write speeds (if you have a full ShaderCache) this should not hinder your performance! Do NOT put it in your Program Files or other system directories, CEMU will lack permission to write saves, shadercache, and other info! You simply download the new update and extract the .zip'd files over your older Cemu version. That's all you have to do presently, to update Cemu. If you're upgrading from a version before 1.15.1 you will need to delete your graphicPacks. After updating CEMU, use the download button in the graphicPack window to download them fresh. Use this button to update the packs from now on. You can copy the download link from Cemu's download page, paste into your URL bar, and edit the version number to point to the version you wish to download. Choosing of a/b/c/d+ versions not available for download while using this method. To connect online you'll require your Wii U with Homebrew support, and a way to dump files from your Wii U NAND onto your SD Card or an FTP client. Cemuhook is required for motion providers to work with CEMU. Note: If you have older packs from before using the download button, please delete them before using the button! Keep in mind the higher resolution you go, the more likely you will lose FPS. Dynamic Gamespeed - 32 or a less value if preferred. Fence Method - Performance, if buggy try Accuracy. Set FPS Limit - 60 or 30FPS, 30 is the Native Wii U framerate. NPC Stutter Fix - If you disable GX2DrawDone() you can use this, but you will still need GX2 when using the Camera Rune. No Depth of Field - Only recommended for performance stability, otherwise user preference. Clarity - Preset: User preference, use the Reload Shaders button to preview. Anti-Aliasing - Preset: "Nvidia FXAA" - if you get grayscale color, use "Enabled AA" preset. Averages framerate then sets the current target framerate the game's engine expects after the average is calculated. Fixes arrow trajectory physics, paragliding physics, and Link movement physics when over 30FPS. It's a smooth experience overall and is recommended over a "vanilla" game experience. Disable FPS++ if you encounter an in-game permanent freeze - finish that instance with FPS++ disabled and then enable it again for the rest of the game's playthrough. A set of framerate limiters, made with a modified FPS++ -- omit calculations for Dynamic FPS, going below the target framerate will put the game in slow motion. (Currently Unstable) Not recommended to be used until it has been updated to support graphicPack v3. These packs enable specific cheat codes. Allows the user to set how long the in-game 24-hour period will last, in contrast to real-life time. Allows you to disable or change the color of the Red Beams that emit from defeated Divine Beasts. You can click "Reload Shaders" button at the bottom to see the difference in-game. Requires manual editing of the graphic pack. Allows changing the light source color on various Sheikah objects. Removes some user interface (UI) displays and should be used in conjunction with the in-game option for "Pro Mode" that also helps disable more UI displays. Will not completely remove all elements. For COMPLETE HUD Removal, look up the Pro Hud mod on GameBanana for Wii U; you will need to make it as a graphicPack as Cemu now allows replacing game files with a graphicPack. Removes the blur effect when you focus an enemy during battles as well as when using the camera rune; can benefit performance. Allows you to select a [Color+Tonemap+Brightness+Contrast] preset from the right-hand drop-down menu. Changes the game's mipmap loading. Presets allow you to change for keeping higher quality models loaded at further away, or to minimize quality and slightly boost performance on strained PCs. Increases the ability of Shrine walls & objects to reflect light or mirror objects. May cause a performance hit. Fixes the square lighting around torches in the village. Not necessary if you use General Settings > Full sync at GX2DrawDone(); otherwise it will prevent certain crashes. Before, smoke effects would be rotated incorrectly and flat. This fixes that. Select an Anti-Aliasing mode which helps eliminate the stair-stepping effect in order to obtain smoother textures & models. The best but heaviest form of Anti-Aliasing. Allows you to select a resolution preset on the right-hand drop-down menu. Lower = Blockier. Higher = Smoother, but harder on GPU. Allows you to select a shadow resolution preset on the right-hand drop-down menu. Transferrable ShaderCache - This is the first cache made by CEMU. When created, we do not recommend deleting this cache or you will have to replay the game from the very start to obtain the information again. This cache is converted Wii U GPU Shader Code, readable by PCs; it can also be transferred across PCs as it is not affected by different drivers or hardware. It is created when you first encounter an effect, texture, or other environment factor in a game; while it is being cached, the game will freeze momentarily--this is normal and will happen only once per unique shader you encounter. Once you have a Transferrable shaderCache built, CEMU will use it when booting a game in order to create Precompiled shaderCache. You can find Transferrable shaderCaches online but they are likely semi-corrupt; we do not provide download links because this is considered an act of piracy, as they contain copyrighted Nintendo code, extracted directly from games. Precompiled ShaderCache - [Note: Nvidia GPU users should have Precompiled Shaders disabled until further notice.] During the game's first boot, introducing the first discovery of shaders for your Transferrable ShaderCache, Precompiled ShaderCache is also generated simultaneously. This cache is converted Transferrable ShaderCache that matches your GPU Driver, Hardware, and CEMU version; each time any of these three things change, the Precompiled Cache will become invalidated & unusable. CEMU will usually detect this automatically and delete it for you, but sometimes it is necessary to delete it by hand as a precaution -- if it's corrupt, sometimes errors will cause games to crash or behave strangely as well. Deleting this cache will require you to wait a longer period of time to load a game until CEMU has fully compiled the Transferrable shaderCache back into Precompiled shaderCache & GLCache. GLCache - The GLCache is essentially converted Transferrable/Precompiled ShaderCache used by the OpenGL API of your GPU. When CEMU is compiling your ShaderCache after booting a Wii U Game, you are populating the GLCache for your GPU to avoid stuttering as you attempt to play. With CEMU versions before 1.15.1, this cache gets reset on occasion -- Any games (or applications) that use OpenGL will build a cache and may cause the the size of the GLCache folder to exceed it's threshold of 256MB (Nvidia,) 64MB (AMD), causing the cleaning flag to raise & it is then wiped on the next PC Restart. GLCache will always be wiped after a GPU Driver Update. As of Cemu 1.15.1, GLCache for Nvidia will now be stored in the X:_/_/Cemu/shaderCache/driver/nvidia/ directory; in addition, the GLCache will now be preserved during system reboots and will allow Cemu to continue writing data to it after it reaches 256MB. You should clean the GLCache after each GPU Driver Update you install. Nvidia's drivers do not like Precompiled Cache, therefore games within CEMU will always stutter when using [only] Precompiled ShaderCache--this is because Precompiled ShaderCache on Nvidia does not populate the GLCache as planned; that said, Precompiled Shaders should be disabled. Users on pre-1.15.1 versions of CEMU can try to mitigate the effect this has on their gameplay by deleting [AND] disabling their Precompiled ShaderCache and clearing their GLCache in order to repopulate the GLCache entirely. Precompiled ShaderCache is good for AMD Systems, as GLCache is limited to 64MB. Precompiled ShaderCache does not work on Nvidia Systems and should be disabled within Cemu's options. Note: Older Transferable ShaderCaches from pre-1.8.0 will not work with newer CEMU versions. [BotW] 11,000 Cache vs 9,600 Cache? Game Update from 1.3.1 to 1.4.0 invalidated caches. Transferrable Cache that was made collectively with both -/1.3.1 and 1.4.0/+, together, will contain duplicates that will not be detected by CEMU as pointless, effectively bloating your RAM. Non-bloated cache for Breath of the Wild should be roughly 9600 shaders. Caches far exceeding this upper limit are known to be from older versions of the game. All other known games should be fine and should not experience this problem. There is no performance decrease with a bloated cache, however if your RAM is not sufficient to store all data on the RAM and therefore puts it on your HDD/SSD Pagefile, you may notice a sufficient decrease in overall performance for the game in question. Memory Swapping (pageFile,) is often much slower than RAM on its own, depending on the quality and speed of the storage device your pageFile is located on. In rare cases, more specifically on very slow HDD storage, this may result in crashes of the game. Apply your changes. Close msconfig. You may want to test Game Mode on and off. Keep in mind you may want to re-enable these for PC games in the future. These services are unnecessary for Cemu and you can see a rough 1~5 FPS increase. For games you want to use them with, make sure to enable the services again and reboot. If you use any Xbox-integrated programs like Xbox Messages, Xbox Live, etc.. You will be required to enable these services and restart the PC before they will work again. Additionally, make sure all programs that are running are closed before running CEMU. Simply having Discord, Firefox, or Google Chrome open can decrease your performance. Using OSDs may cause severe FPS drops or graphical issues while using CEMU. Make sure they're disabled for the duration of play. accurateShaderMul = true changing "true" to "min"
Note: This may disable some textures, however it can save quite a bit of RAM. But if you do run out of available RAM, stuttering will be unavoidable. some harddrive space as they are unneeded for Nvidia systems. AMD's lack of performance is due to their deprecated Windows OpenGL support since moving their attention to the Vulkan API. Had AMD added additional compatibility extensions it would not have the problems it does, and to be fair, it's mainly Breath of the Wild that is affected. Will AMD ever improve their OpenGL driver support?--We don't know. Probably not. In the meantime, Linux users can use MESA drivers for AMD which aren't applicable to Windows systems, seeing anywhere between a 20~50% performance increase in contrast. It's pretty much streamline from there. Further support for Linux related questions can all be discussed within our Official Discord in the #Linux channel. It's highly recommended you research this topic before deciding to attempt it. If you fry your hardware, I take no responsibility. By default, core parking basically makes your processors go into a sleep state known as (C6) and is supported by most new processors. This allows your computer to save power. There is a trade off for disabling parking. If you use a laptop or tablet, you may notice a slight difference in battery life once you disable core parking on your CPUs. If you disable core parking on your CPUs, your computer may have faster benchmarks. (Reported higher frame rates by gamers and power users). BD PROCHOT - Stands for Bi-directional Processor Hot. PROCHOT is an emergency throttling system that is used when a CPU hits its maximum temperature (100 or 105C). BD PROCHOT is a system some laptops use where the CPU will be throttled when another component, such as a GPU, reaches a set temperature—even if the CPU is not hot to the point of throttling. Some laptops trigger thermal throttling as low as 60~70c, well below the maximum safe temperature. You can look into ThrottleStop and their documentation, then see if this is what's causing your CPU Core Performance to always drop below Turbo Speeds. Exzap and Petergov plan to add native support for the Official Wii U Gamecube Adapter at some point. First of all, if you're experiencing any weird anomalies with graphics, check out Darkemaster's GPU Compatibility List. BotW: If you encounter any freezes during cutscenes or issues while facing Bosses, make sure to cap your FPS to 30 temporarily for that area. If you encounter any strange artifacts or issues that don't disappear with a restart of Cemu, you can try deleting your Precompiled cache and rebuilding it. If it's still in error, it may be your Transferable shaderCache; rename it temporarily for the specific game and then delete the Precompiled shaderCache once more. If still persistent, that's when you would want to try getting assistance on our Discord or trying seeing if your GPU Driver is either outdated or corrupt by following the [ GPU Drivers - Updates, Downgrades, and Corruption ] section below. GPU Driver Updates & Downgrades, Corruption? AMD Users: Each time after updating or downgrading your GPU Driver, you will need to delete your Precompiled shaderCache. If you think your driver is corrupted or your driver isn't behaving as expected, you can use DDU to uninstall your drivers in Safe Mode. Restart your computer. Reinstall your driver of choice afterwards. Note: If reinstalling your driver does not fix the issue, make sure to view the other bugs mentioned below. Ask on the Cemu Discord if any other users are having problems after changing GPU Drivers. This option is recommended to help avoid potential CPU<->GPU desync issues and accurately emulate the CPU<->GPU sync behavior that most games expect. Keep in mind that the higher the resolution you use in-game, the more of a performance hit you will take. The Camera Rune being unable to detect objects for photos. Bugs and glitches should be reported on our Discord! The Discord is more than just for troubleshooting. Our main community discussion hub and development are all focused there. Message me on Discord if you have any questions regarding the Guide. Thank you. I keep this guide updated for you guys! If you appreciate it, please consider tipping me - I appreciate every penny!